Whether you call it southern bayberry, candleberry, bayberry tree, or tallow shrub, the southern wax myrtle is a plant that we at Amazing Blades Landscaping see a lot in our line of work. One of the things we don't like to see on our clients wax myrtles is any type of infestation, fungal or insect, but one one insect in particular has us talking today... the wax myrtle scale. Wikipedia describes scale bugs as "small insects of the order Hemiptera, suborder Sternorrhyncha. They comprise the superfamily Coccoidea, previously placed in the now obsolete group called 'Homoptera. '" Now that we're all just a little bit smarter, let's start talking like regular folk. The wax myrtle scale is referred to in this way because of its proclivity for wax myrtle bushes. Scale insects are parasites that usually feed directly off the plants vascular system, draining it of sap. The wax myrtle scale feeds on wax myrtles exclusively, killing off one branch at a time, until the plant as a whole dies. 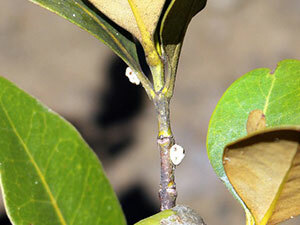 According to a survey of coastal areas in South Carolina, Georgia and Florida done by Clemson University, wax myrtle scale was found in the coastal cities, but not on any of the inland trees. Also, none were found in any of the plant nurseries surveyed. Basically, it appears that these are natural occurring infestations and are not being passed through the nursery trade, so far. Growers and gardening enthusiasts alike need to be aware of not only their own trees but also ones growing in nearby landscapes. To use a common saying, "one bad apple can ruin the bunch." Once an infestation has started on even one branch, if not handled in a timely manner, it can turn into a whole stand of trees becoming victims. One notable point from the survey is that it appears that the landscaping industry's own practice of pruning back myrtles can also lead to more scale infestations. "More than 50% of the pruned wax myrtles exhibited damage, whereas only 8% of the unpruned bushes exhibited similar damage." Whether it be plant stress from cutting or that the pruning just creates more open, lush bug bait, the wax myrtles scales take full advantage. Try using wax myrtles in areas that need little pruning and shaping, instead of using them as fencing or as privacy barriers. If you've noticed branches, or even whole areas, of your wax myrtles turning brown and dying, you might want to inspect your trees closely or, better yet, have the professionals at Amazing Blades take a look at them. Infested branches need to be removed completely and disposed of, and when we say disposed of, we mean cut it into a large trash bag or onto a large tarp, wrap it up and run for the hills! Any parts of the infested branch that drop or get left behind will just become new sources of trouble. And not to burst your bubble, but regular pesticide applications don't work. Pesticides by themselves don't work. Only a combination of horticultural oil applications, insect regulators and systematic doses of insecticide have been shown to make a difference when it comes to the wax myrtle scale. We at Amazing Blades are trained in the types of insecticides and their applications. If doing it yourself, make sure to not use poisons that will harm the beneficial insects that feed on the wax scales, like some wasps and ladybeetles. Wax myrtle scale infestations will not be an easy thing to manage or eradicate but with persistence and knowledge, your trees can shine in the sun. Amazing Blades Landscaping knows that your trees, shrubs and flowering plants are investments in your home and no one likes when an investment goes south. Let us help you take care of your landscaping and natural areas with our expert lawn services and our trained, knowledgeable team of insect experts.